A few years back, I landed in Belgium’s Charleroi airport during a November cold snap. The woman at the car rental desk shot a look at the frost-covered ground, gave a shiver, and complained about the chill. But later that afternoon, as I stepped off a busy Brussels street into Brasserie Cantillon, one of the few remaining lambic breweries in Belgium, owner and brewer Jean Van Roy was pleased. “The best temperature for me is around zero Celsius,” he said, as the wonderful scent of wort filled the brewery. Weather is an extremely important consideration for the kinds of beers Van Roy makes. Weather dictates the types and density of microorganisms riding the breeze, and for the purposes of naturally-inoculated beer, less is more. In his famous 19th century brewing text, brewing engineer Georges Lacambre warned not to brew during the warm months, lest the coolship produce “versoemer, or the ‘taste of summer’”—a disaster marked by “nauseating odor.” Good lambic is made only with cool-weather microbes, milder of temperament, gentler to beer. Van Roy was busy with a vessel full of pulverized hops when I arrived and told me to look around. I followed my nose up a floor to the kettle, from which wort was being pumped further upward, to a loft at the top of the building. There, in a room ringed by open windows, was a large, pan-shaped vessel called a koelschip (or coolship). Hot wort poured in from a pipe, and the contrast in temperatures made the room steamy as a sauna. That wort would sit overnight, attracting wild yeast and bacteria to its welcoming, sugary warmth, and then Van Roy would lock it up in wine barrels for up to three years. Inside, those wild microorganisms transform the wort into the most complex, refined beer in the world. Visiting Cantillon in Brussels on brew day is one of the most rewarding experiences any beer fan can enjoy. Arrive early enough, and you might witness a turbid mash, an hours-long ordeal that prepares the wort for the fury wild yeast unleashes. Then there are the rows and rows of wine barrels, resting quietly while the beer inside slowly ripens. They gather in a kind of chapel of fermentation, a place of stillness so guarded that even the cobwebs are not disturbed. (They contain colonies of that lovely wild yeast.) A barrel head bears a hand-painted sign, serving as a benediction: “Le temps ne respecte pas ce qui se fait sans lui” (roughly, “time does not respect what is done without it”). Another joy is Van Roy himself. “Wild yeast” is an appropriate name, and it takes a special brewer to work with the variations they produce. At times taciturn or abrupt, Van Roy is, when given to speech, halfway between poet and philosopher. “I know my beer; I feel my product. The beer is alive. I feel, I smell what the beer will accept or not.” Brewing the beer is only the first—and easiest—step. Once it has been nurtured to maturity, a lambic-maker samples each lot, which after months or years will each have their own character. Then, by feel and experience, he begins making a blend. He’ll pick out batches that have different notes, composing a final composition like a painter, with drizzles and dabs from many different barrels. The greatest example of this process is an oude gueuze, which not only uses different barrels, but lambics of different ages. Inside a barrel, microorganisms play their roles in a continuing dance. In the first stage, Saccharomyces yeast in the air conduct a regular alcohol fermentation, producing many fruity esters along the way. Next come the bacteria and a lactic fermentation, which will turn the beer sour. Finally, the slowest member, Brettanomyces yeast, comes on after months and continues to slowly munch the sugars other creatures left behind. Blending different ages of lambic means pulling different varieties of these compounds into the final blend. It is difficult to characterize a beer that can change year to year, so I will tell you about the Gueuze I had the day I visited. It was a five-year-old bottle Van Roy plucked from the cellar. It bubbled into our glasses like champagne, wafting a surprisingly pure scent of lemon. There was something of the cellar in the nose, but just a suggestion. The lemon was assertive on the tongue as well, a flavor enhanced by spiky acidity. The young lambic in the blend had not been fully exhausted—there was a kiss of sweetness. 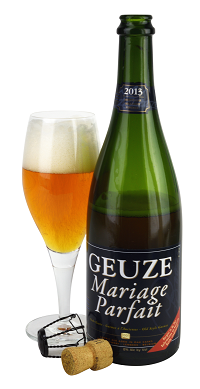 It’s a disservice to call gueuzes “sour,” because it reduces the most complex beer in the world to a single note. While present, the acidity shimmers underneath a beer exploding with other flavors and aromas—rock candy, woody tannins, nectarine, blue cheese, chardonnay grape, even mushroom and brine. Drinking a true gueuze is a breathtaking experience—whether you’re drinking it at the brewery or at home. What makes lambic so special, so unlike any other beer in the world? If anything can be a product of place, it is lambic. As we were talking, Van Roy put on his poet’s hat. Find a bottle of Cantillon Gueuze and you will see what he means. Tasting Notes: An unusually dusky gueuze, the color of dark honey, and also one of the least effervescent. 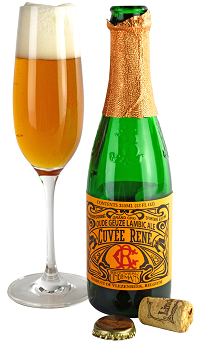 The nose, however, is pure lambic—a vinous foundation with earthy, cellarlike notes along with some spiky fruit. It’s a very tart example, with a sharp acidity that evokes malic acid. A dry ale that finishes with a long, lingering aftertaste. 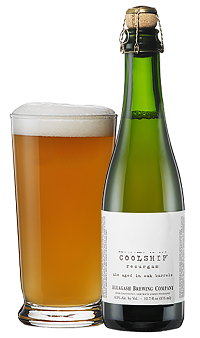 Tasting Notes: In contrast to Lindemans, Allagash makes a straw-pale beer. The aroma suggests this will be an entirely different experience, with cinnamon, brine and a touch of vinegar. That acetic nose pops on the tongue, but is balanced by spice and vanilla. Tasting Notes: The cork pops explosively, carrying with it a deeply herbal aroma inflected by cedarwood and pin-pricks of kumquat. The least sour of the bunch and the most complex. The acidity is reminiscent of orange peel, and etched with the same drying bitterness. It is the sweetest and most balanced, and the best point of entry.